RYAN ROOKIE!!! 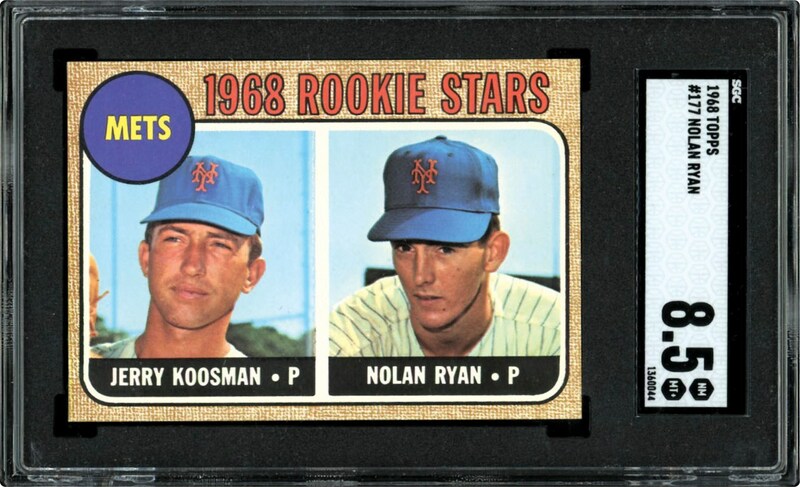 The classic 1968 Topps Nolan Ryan Rookie card that similar to many other high profile Hall of Fame 1950's/'60's rookie cards is currently "hotter than a pistol". Incredibly, high grade values have literally soared "through the roof". The most sophisticated collectors are actively pursuing this Hall of Fame Rookie card. Presented here just happens to be one of those highly coveted SGC NM-MT+ 8.5 Nolan Ryan rookie cards. Synonymous with this card's unbridled pinnacle stature is Hall of Famer Nolan Ryan's place in baseball history with the fire-balling right-hander the record holder for lifetime strikeouts (5,386) and no-hitters (7). His reputation as one of the game's immortals was solidified when he was voted as the starting pitcher on baseball's team of the century. Every primary quality is pristine including image contrast, coloring, print registration, edging, pinpoint corners, etc. Most impressive, however, is the atypical virtually perfect centering, with skewed images characteristically plaguing this most condition sensitive issue. The final exclamation point is a verso that, similar to its obverse side brethren, reveals its original "pack-fresh: qualities. 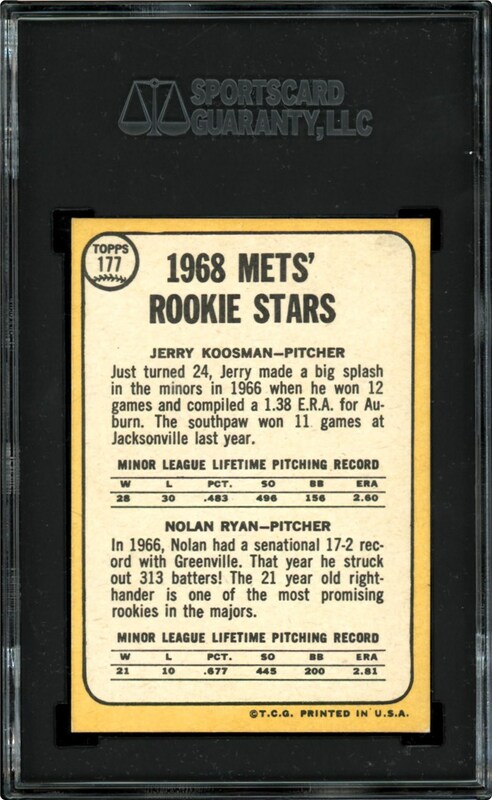 Along with the iconic Mantle, Mays, Aaron and Clemente inaugural cards, this Nolan Ryan museum worthy marvel currently resides as one of the most coveted rookie keepsakes, with an abundance of elite enthusiasts anxiously awaiting to capture it for their world-class gatherings!